Comments: Australian Master Luthier, Simon Marty creates a gorgeous beauty that matches herself in power, voice, and expressiveness. 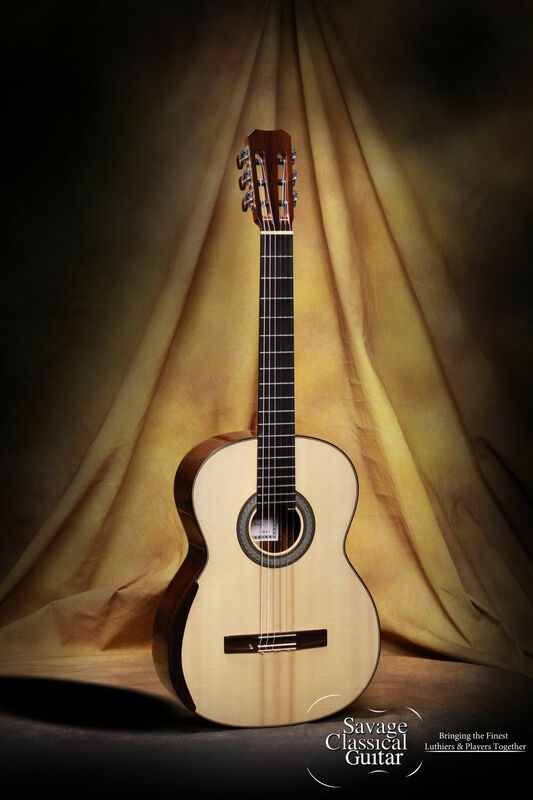 Last of her kind in the USA, the Brazilian Rosewood is simply spectacular as is every other aspect of this unique classical guitar. As per the dealer it was taken from, Simon will not deal with the paperwork associated with bringing guitars to the North American continent that are subject to intense scrutiny, i.e. Lacey Act. Can’t say that I blame him. The guitar is new, not played except by the dealer, where I now own it and present it to my American customers. For the same reasons that Simon will not send a guitar like this to our country, I can only offer it to my own clientele in the 50 United States. The guitar, owned by a dealer, clearly demo-ed the guitar for clients, and in the process, caused the slightest bit of play wear. The guitar has small marks on the back of the headstock. They are very slight, but I disclose everything I know of when it comes to guitars. There is small disturbance to the finish on the back, by the smaller bout, on and by the binding. It is not visible, but I can feel it with my fingertip. I believe I can smooth it out, but again, if I know about it, I state it clearly. OK, some further points. That is a curved armrest to the left side of the lower bout. It is NOT a weird shadow or disfigurement of the guitar? Somebody actually wrote that to me. It is very comfortable, and can be barely seen when playing. Additionally, those three vertical lines running from the rosette to below the bridge are NOT shadows. They are stripes in the Spruce specifically chosen by Simon. Tiger Striping was the term I heard used. The guitar is ridiculously beautiful, in the photos and more so in person. I’ve discounted the guitar another $1K to reflect the lack of a Karura Case, which it originally came with. I was originally told it was destroyed, but clearly it was simply switched out for a different and clearly less expensive case. Nothing to be done about, the discount applies to the lack of case, as well as some of the insignificant and slight marks on the guitar. There will be zero negotiation of the price as it stands as listed. Thank you kindly for your understanding. I have more recent commentary below, after refreshing my memory of the guitar. I’ve just sat down with her this morning, after a client had played her, complaining about the guitar having a nasally voice (if that’s a word). I sat down to play and listen objectively, realizing the player’s technique simply may not be suited to the guitar. I was correct. I also realized that I never recorded the guitar? Weird. In the end, I have to wholly disagree. The guitar is not a warm blooded creature, per se, but she is not nasal voiced. A neutral right hand to a warmer position, and the Bach was flowing out of her with wholesome basses and crystal highs, while some moody music I played was also right up her alley. I could play this guitar all day, set up low, able to drive her, color her beautiful voice, falling in love with this guitar all over again. She is gorgeous in all regards.